Does My Spouse Have an Interest in My Business When We Divorce? - Amaral & Associates, P.C. These factors must be considered as a whole. However, one factor that often is given a little more weight on this issue is the “Contributions of the respective parties in the acquisition, preservation or appreciation in value of their estates.” Here, the court looks at what the non-business owner spouse contributed toward the business. Did they help out at the business with any work such as bookkeeping or administrative support? Did they help with any business dinners or important business meetings and events? What a spouse contributed towards the business can be an important factor. However, another important factor is “Contributions of Husband and Wife as homemaker.” Did the non-business owner spouse take care of the children and the household so the business owner spouse could have more time to manage the business? If the non-business owners spouse did help in this capacity, this can be another important factor in what, if anything, the non-business owner spouse is entitled to from the business. The Probate and Family Court will also consider when the business owner spouse acquired an interest in the business. Was it several years before the couple was married, and the business owner spouse put in their own work before the marriage to make the business profitable? Or was the business acquired only months before the divorce was filed? These are also important factors. As if analyzing the Section 34 factors isn’t enough, the Probate and Family Court will also need to know what the business is worth. This often requires a business appraisal by a financial expert certified to appraise businesses. These appraisals can be costly, but the return can be potentially significant. In doing a business appraisal, the expert commonly puts a monetary value on the business owner spouse’s interest in the business, but will also set a salary for which support can be calculated. This is where things can get confusing. Although a business owner spouse is drawing an income from that business, it may not be the “correct” income based upon business appraisal standards. Some common issues that the appraiser must consider are: 1) is the business owner using the business to pay his/her own personal expenses; 2) is the business owner working a normal number of hours; 3) does someone else in the business (oftentimes a relative) have the control to manipulate the spouse’s income. This all has to be factored into valuing the business and also coming up with the business owner’s appropriate income. Once this is all considered, then it’s time to decide what, if anything, the non-business owner spouse is entitled to from the business. Oftentimes, the salary that has been calculated by the business appraiser is used to calculate child support and/or alimony. 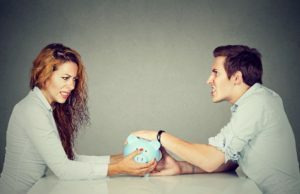 After that, once a value is set for the business owner spouse’s interest in the business, the court determines what the non-business owner spouse is entitled to. If the Court determines that the non-business owner spouse is entitled to share a of the business, this is usually accomplished not by the spouse actually acquiring an ownership interest in the business, but by receiving a payout by the business owner spouse. Sometimes this is made in the form of one lump-sum payment, and other times it is made in installment payments over time. Either, way, the non-business owner spouse is monetarily compensated for their share in the business. Determining a non-business owner spouse’s interest in the other spouse’s business can be complex and confusing. It is important to ensure you have a knowledgeable divorce attorney and a business appraiser to guide you through this process, regardless of which side you are on.